To capitalise on the emerging opportunities in battery energy metals, Tando Resources (ASX:TNO) signed a deal earlier this year to acquire 73.95% of the SPD Vanadium Project, a large, high grade vanadium deposit in South Africa via a milestoned transaction. As we outlined at the time, vanadium is shaping up as a hot metal, perhaps poised to replicate recent standout performances of other new-energy metals, the likes of lithium and cobalt. 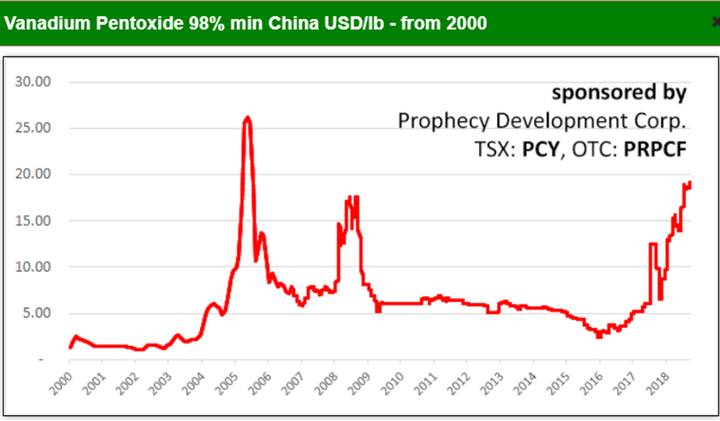 This seems to have borne fruit with the current vanadium pentoxide price surging over $20/lb and tipped to go higher amid continued supply concerns (source Metal Bulletin). Not only has previous exploration activity demonstrated that TNO has invested in a highly prospective vanadium asset, but the project will benefit from all the essential infrastructure required to establish a working operation which is available within a 30 kilometre radius of the project. 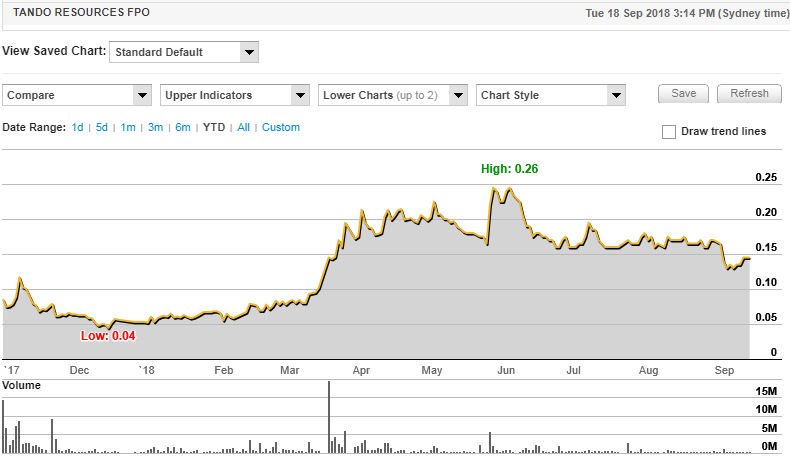 TNO has all the hallmarks of a hot stock, just as hot as its core commodity, with its share price increasing five-fold from approximately $0.05 in March to an all-time high of $0.26 in early June — an outstanding performance for a company that only listed on the ASX in November 2017. Both TNO and the vanadium price have exceeded expectations, and having identified high-grade assays at the SPD Project in mid-2018 the company has laid the foundation for a much anticipated drilling campaign over the coming months. TNO decided to expedite drilling of shallow, high-grade vanadium pipes after a heliborne magnetic survey and on ground sampling delineated outstanding targets which provided evidence of the potential for a low-cost Direct Shipping Ore (DSO) operation. Management sees potential for such an operation to provide early cashflow. The subsequent drilling campaign has just commenced, and characteristic of Tando, the company has been quick to taste success. Last Monday it reported that the first two holes had hit the mineralised unit it was targeting, which comprises the magnetite layers known to host the vanadium at SPD. This proved to be a catalyst for a share price increase of about 15%. But with plenty of drilling still to come, there is scope for further upside. Both intersections are close to historical holes which returned high grade vanadium whole rock assays and generated excellent vanadium grades in magnetic concentrate. The results are an excellent first step in TNO’s aim to convert the existing high-grade ‘foreign’ Resource (outlined below) at SPD to a JORC-compliant Resource that’s due for release at the end of October. Hence, the coming months could well feature numerous share price catalysts as mineral grades and other data delineated in the drilling results will feed into the establishment of a JORC Resource. The attention now turns to Phase One of the drilling campaign which will also include the first holes to be drilled at the shallow, high-grade vanadium pipes that lie within a three kilometre radius of the SPD deposit. 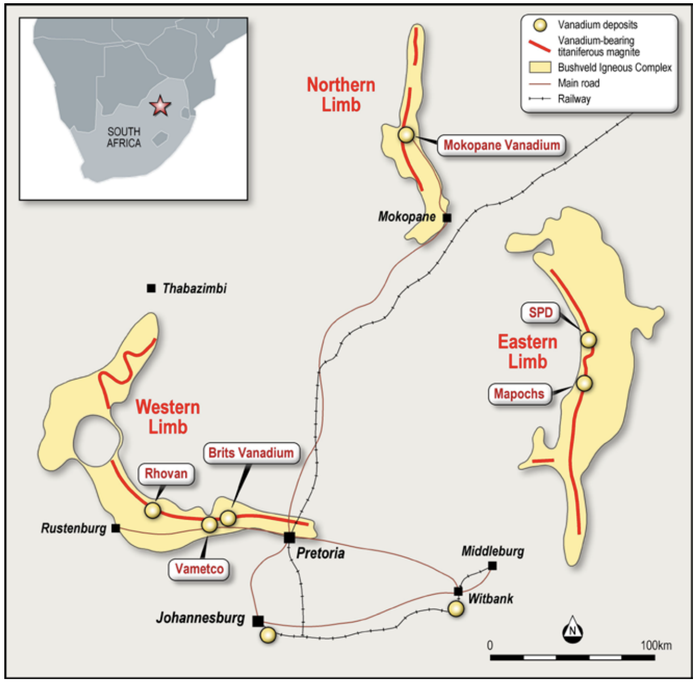 Here you can see the location of vanadium deposits in the Bushveld Igneous Complex in South Africa. Note the SPD Vanadium Project on the eastern limb, 30 kilometres from the Mapochs mine which has a processing plant and railway infrastructure. This resource rich region of South Africa is host to numerous mining operations and processing facilities including essential power and water infrastructure. TNO has reported a host of high-grade vanadium assays from samples taken from the surface of these pipes with results consistently above 2% vanadium oxide (V2O5) as indicated below. Following completion of the Phase 1 drilling program, TNO will move straight into Phase 2, which will be aimed at upgrading the maiden JORC Resource to an Indicated category (provided results are as anticipated). Phase One of the drilling program will comprise 18 holes for 1650 metres at the SPD deposit, where there is currently a Resource of 513 million tonnes at a grade of 0.78% V2O5, defined under the SAMREC code. The first visual results from drilling of the pipes are expected in coming weeks along with assay results. Phase Two is currently designed to comprise 58 holes for 5550 metres. The cost to complete the entire Phase 1 and Phase 2 drilling program and the resultant resource estimations is projected to be A$1.4 million. Importantly, the company is fully funded for the drilling programme as well as the metallurgical and mining studies which will follow completion of the drilling program. As Tando embarks on this extensive drilling campaign it is important to note that it isn’t working from a blank sheet of paper. The SAMREC Resource is a ‘foreign Resource’, as defined in the ASX Listing Rules, and is detailed below. Its potential is demonstrated in the following outline of vanadium projects which features both their tonnage and grade in concentrate. The drilling is aimed at converting this foreign Resource to a Mineral Resource Estimate (MRE) as defined in the JORC code. TNO expects the MRE will be published by the end of October 2018. Importantly, mineralisation identified in the first two drillholes has demonstrated a strong correlation with that identified under the SAMREC Code. 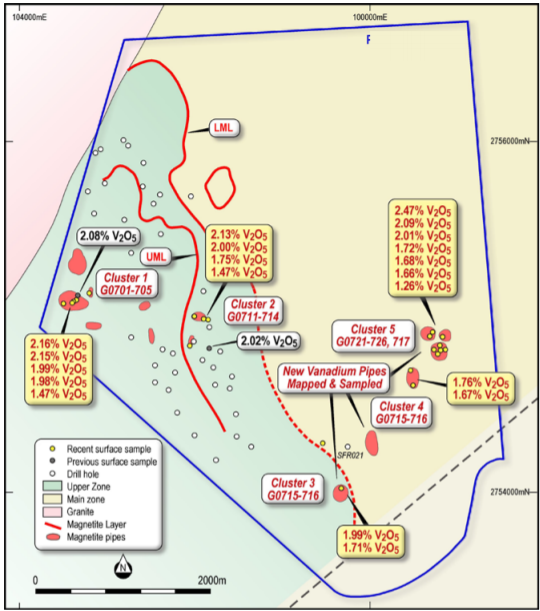 The recently encountered mineralisation has significant similarities with the historical data. TNO noted that these initial results are an excellent start in converting the high-grade foreign Resource at the SPD Vanadium Project to JORC (2012) status. Due to their correlation with historic drilling results, these first two holes mark the ideal start to the drilling program. Management expect that in less than six weeks shareholders will have a good initial understanding of the quality and the size of SPD, a development that could attract attention and garner investor support. Further drilling will have the potential to expand the Maiden Resource, as well as assisting in upgrading a proportion to Resource categories that indicate greater certainty in terms of contributing to production. Having established what the company believes has the potential to be a commercial project there is then the prospect of moving through the feasibility, financing and decision to mine steps, with the possibility of negotiating offtake agreements through these stages. 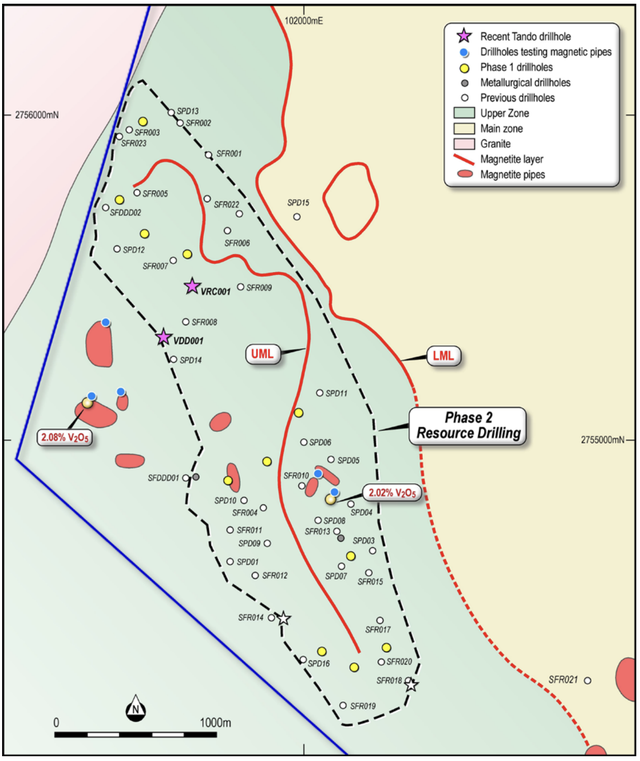 While this may appear to be getting ahead of ourselves, it needs to be noted that the first two holes have not only demonstrated high grade mineralisation, but to some considerable extent they have provided management with added confidence regarding the data bank that relates to the SAMREC Resource. In addition to this data, Tando has an array of high-grade assay results that were collected in the months following the acquisition. On this note, early exploration focused on drilling preparations and mapping and sampling of high grade vanadium pipes identified within the property. Twelve vanadium pipes were identified with 20 samples submitted for analysis. These samples returned an average of 1.87% vanadium oxide with seven samples returning grades of more than 2% V2O5, higher than many significant operating vanadium mines. It should be emphasised that the results discussed here are whole rock (or in-situ) results, not concentrate grades, and compare favourably to the already high in-situ grade of the SPD Project (0.78% V2O5). These excellent results provide firm evidence of the potential for these pipes to underpin a low-cost, high-grade DSO operation with a short development timetable. Management said that the concentration process could be relatively simple, with the end product able to be sold as feedstock for a downstream processing plant, or processed cost-effectively using a different method. This could potentially provide the company with vital cash flow, enabling it to partly self-fund a larger development and/or provide financing for future exploration. Given the extensive high-grade mineralisation, the latter is a real possibility as a resource expansion would normally increase the company’s valuation, providing it with share price traction and positioning it more favourably in terms of attracting partners or negotiating financing. 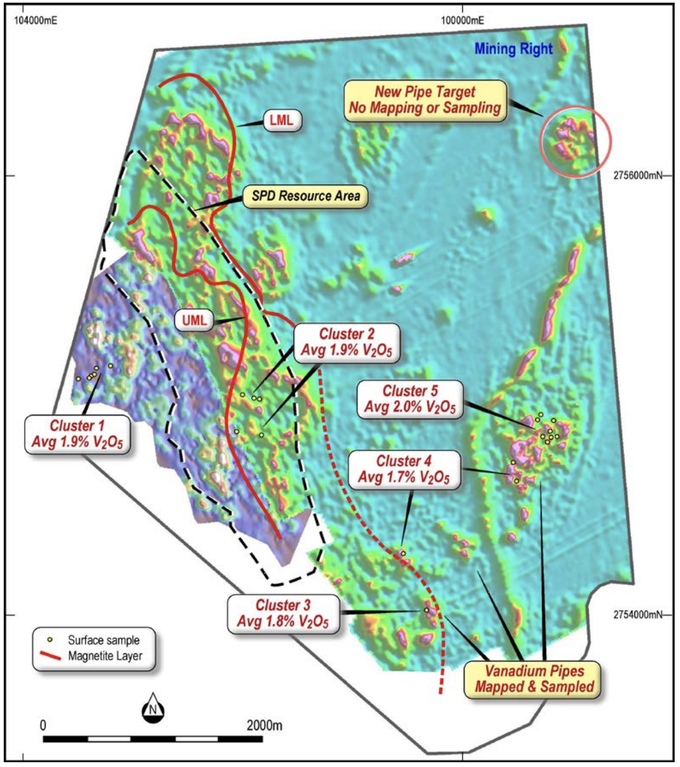 In order to accumulate further data, TNO undertook a heliborne magnetic survey which clearly delineated a host of the shallow, high-grade vanadium pipes within a three kilometre radius of the established vanadium deposit as indicated below. The magnetic survey showed the pipes are of a much bigger scale than originally thought. One cluster of pipes measured 600 metres by 600 metres (Cluster 5). The magnetic survey also identified a new 400 metres by 400 metres cluster of pipes in the north-east area of the project which had not been mapped or sampled. Management is commissioning a study into the potential market and pricing for the DSO product, specifically the product specifications desired by likely buyers. TNO managing director, Bill Oliver, said the scene was set for the company to demonstrate the value of the world-class SPD project. Highlighting the prospects of the known deposit and reflecting on the range of strategic options open to the company, Oliver said, “We know we have extensive high-grade vanadium at SPD and that the value of the project will become clearer as we convert it to JORC status. Oliver also noted that there is ‘outstanding potential’ at the surrounding vanadium pipes, which have demonstrated host high-grade mineralisation from surface and may therefore underpin a low-cost DSO operation. Of course, the other key catalyst is the vanadium commodity price. So far, the upward momentum in the vanadium price has run parallel with TNO’s success — note the sharp rise over 2017-2018 in the chart below. And with the company benefiting from a combination of operational developments on the exploration front and a bouyant commodity price, its shares could experience a run similar to that which saw them hit an all-time high in June. David Morgan who publishes The Morgan Report appears bullish regarding the supply demand dynamics for the metal. He cited increased demand from the battery/energy storage sector, as well as growing usage for applications in construction such as steel rebar, and a variety of components that are used by the aerospace industry. Regarding the latter, he noted that vanadium is a key ingredient in aerospace engines and composite aircraft and satellite bodies. Vanadium steel alloys are used in gears, axles, and crankshafts. Also, aircraft jet engines employ an alloy of titanium, aluminium, and vanadium. Both Airbus and Boeing expect high, single-digit annual growth over the next 20 years, with more air miles being travelled due to a growing middle class throughout the world. However it’s the more down to earth construction industry which represents the key demand driver for vanadium. New Chinese standards requiring increased vanadium content in rebar, to strengthens the steel used in construction, will increase demand for vanadium in China from November 1. Already industry watchers such as Metal Bulletin and Mastermines are noting Chinese exporters are not supplying global markets, resulting in supply gaps elsewhere in Asia and in Europe. 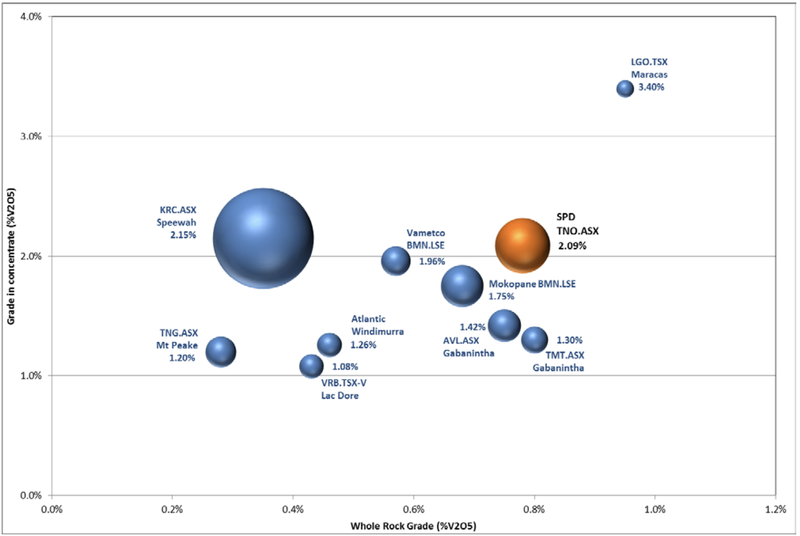 Consequently, just as there are multiple potential share price catalysts for TNO, the price of vanadium could also maintain its trajectory, particularly given that it isn’t solely reliant on the battery sector. That said, there is no doubting that the vanadium redox flow battery offers a possible solution to the energy storage problem. Morgan made the point that unlike lithium-ion batteries, vanadium redox flow batteries are scalable. This makes it easy to ramp up their installation and use to tens of megawatts as demand increases at a particular grid energy storage site. By comparison, a Tesla car battery can hold about 50 kilowatts of power or 5% of 1 megawatt. He also noted that vanadium batteries maintain their capacity, have the potential of 20 years of working life and are not flammable. The commencement of drilling, and the combination of the impending assay results, as well as the testing of the pipes and the conversion to JORC Resource status means there should be strong newsflow over coming months. Any one or all of these scenarios could see the company’s shares return to their mid-year highs, or beyond and lift TNO above its current $21.6 million market capitalisation. Past performance is not necessarily indicative of future results. As part of the due diligence process, clients must consider all factors over and above the past performance of the product. Clients should not engage with a product solely on it past performance.